Ford unveiled the production version of the EcoSport in Brazil, and now its time to take the compact SUV to the masses. And what better way to showcase a product than a match at their own game. The Ford EcoSport dribbled in a mall in Eldorado with football stars – Robinho and Marcos, as a part of promotional campaign for the new compact SUV. After the unveiling of the EcoSport, Ford decides to give the consumers a closer look at their compact SUV, owing to which, the ‘EcoSport Parade’ was launched. Under this, the EcoSport will travel three different cities in Brazil, inviting thousands of people to get a closer glimpse of the compact SUV. The showdown between Ford EcoSport and the Brazilian stars, Robinho and Marcos was the first of the events. Thousands of people showed up at the shopping mall’s parking lot to watch the Football Challenge Wheel. 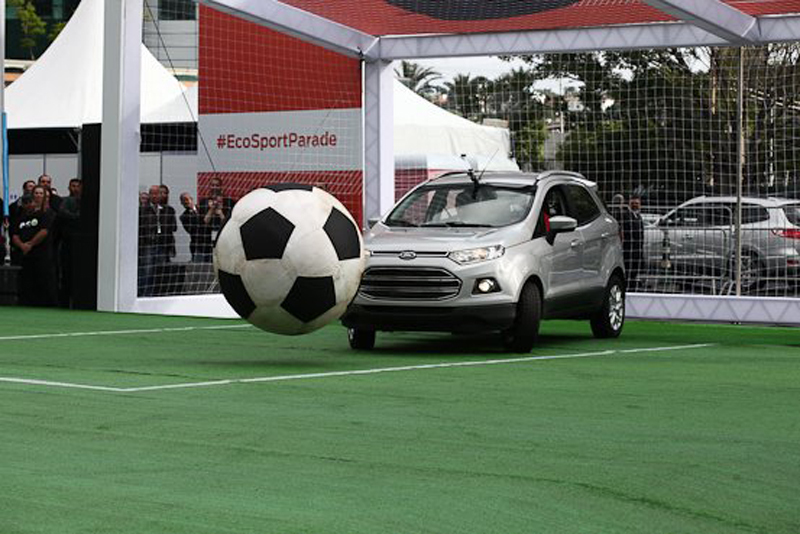 The EcoSport took the post facing the two footballers penalty shootouts. To avoid dents or scratches from the groundbreaking kicks of the two Brazilians, the ball was made of special polyurethane fabric. Moreover, to avoid any dents on the two players, professional drivers – Lindomar Tabarelli and Fabio Costa took the wheels of the EcoSport. The second EcoSport Parade will hit Porto Alegre in July and Rio de Janeiro in August. The American auto giant claims the next events will witness more such bombshells. We can expect the EcoSport to perform a gravity defying volley in the next event.